The ultimate "ALL-IN-ONE" complete and convenient "PLUG-N-PLAY" PA system that can be used in flown and stacked positions. 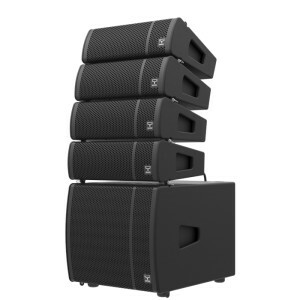 LOUD array system probably is one of the most surprising represents the new generation of active line array compact systems developed to deliver premium performance. 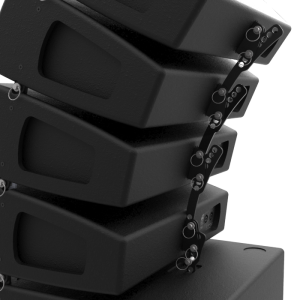 Each “side” of this active line array system compromises four mid/high passive array elements each loaded with a 2x 5” MF European transducers + 1” HF compression driver driven by a active bass reflex design enclosure featuring a 15” LF (4in) EU transducer. Designed and developed for small to medium size installations to deliver a surprising performance with well-defined midrange and detailed highs. With 5 presets than can be loaded on the rear panel, the class D amplifier is prepared for 85-264Vac universal mains and features various electronic protections to guarantee the use of the speaker system in perfect sound and safe operation. The system provides Neutrik® PowerCon® in and out. Each array element comes with an integrated steel rigging system - 4 steps. 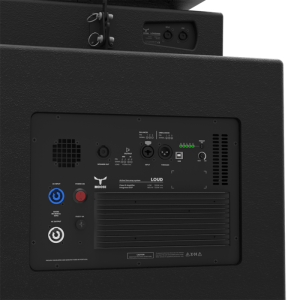 With high quality components and high-technology amplifier LOUD achieves extremely high performance with tight, rock-solid low end, with smooth, detailed highs and a well-defined midrange making this system the ultimate in all-in-one complete and convenient plug-n-play PA system solution for small to medium size applications.